Will it feature an Intel Bay Trail chip too? Microsoft has yet to confirm that it's working on a Surface Mini tablet, but of course that hasn't prevented rumors about it from surfacing. 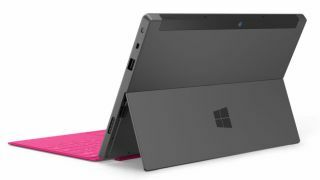 The latest is that the Surface Mini will feature a number of new sensors that give it features similar to what the Xbox One's Kinect sensor is capable of. Those include face and hand gesture recognition, according to Chinese site WP Dang. Microsoft reportedly sent developers from other departments over to the Xbox team to help get the new console out the door prior to its November launch. Those developers, meanwhile, picked up Kinect knowledge that they could take back to their various projects. Those advanced sensory feature will reportedly work much better than the "air gestures" currently available in Samsung phones like the Galaxy S4. According to the rumors so far, the Surface Mini could come in anywhere from 7- to 8-inches. This particular report pegs eight, plus a 1080p display. There are also clues the Surface Mini will pack an Intel Bay Trail CPU so it can run the full Windows 8.1, though an ARM-based Windows RT version may well be in the works, just like with the Surface 2 and the Surface Pro 2. The Surface Mini is not officially confirmed, though Microsoft Corporate Vice President and Surface head Panos Panay has revealed that multiple Surface sizes are indeed coming. Microsoft's line of tablets hasn't exactly done well so far, but it's not too late for them to turn things around. Here's what TechRadar wants to see in the Surface 3!